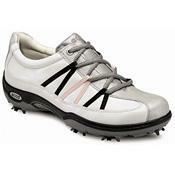 Turn heads on the course in this sporty shoe featuring a textile ribbon design. High performance leather upper crafted from Pinnacle II, Luxe, and Lizzard leather. Textile lining with microfiber in heel for enhanced grip. Two component insole with vegetable tanned leather in heel and Cambrelle on top layer on comfort fiber foam. Metal shank encased in hardened nylon for enhanced stability throughout the swing. Colored thermoplastic polyurethane (TPU) outsole with TPU stabilizer inserts.